During the first decade, the major activities of the BHS consisted of history-oriented public events such a presentations, exhibits, house tours and a yearly Fall Festival on the lawn at Daniels Academy. The merry band of the Brookline Historical Society shared a fondness for local history, but without a home, there was precious little conservation of objects. What few artifacts were collected were squirreled throughout the town, but primarily in the basement of Town Hall under the porch on the Broad Street side of the building. That changed in 1990 when a small house built in about 1850 located on the west side of Route 13, several hundred yards north of Averill Road, became available. The house was formally the home of a beloved local personality, Florence Barnaby. The structure most recently had been an antique shop of Ray and Claire Kecy and John and Susan Loeb, known as the Sunny Knoll Emporium. The owner in 1990 was Kit Dyer, and he agreed to sell it to the BHS for $5,000. The problem was that it had to be moved. BHS President Ann Webb organized a fund-raising campaign which eventually raised the $5,000 purchase price and an additional $15,000 for moving and siting the building. By special town meeting, the town agreed to allow the BHS to place the building on a parcel of town land under a long-term lease agreement. The land was the remnant of what the local militia records refer to as “the common, ” property on which the remnants of the original town pound are located, where the town lockup had stood, and across Springvale Avenue from where the meeting house stood until it burned to the ground. The property was sloped and required fill to accommodate the building’s foundation. Clarence Farwell, always a major force behind the BHS, prepared the site and, the help of Homoleski Foundations, saw to the pouring of a foundation. 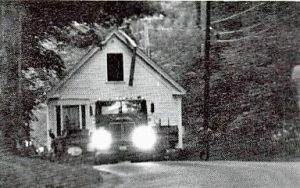 Before sunrise early on 7/16/90, the Barnaby House rolled up Route 13 to Meetinghouse Hill Road, squeezed with difficulty up the west side. With considerable reluctance, the heavy load was rolled across the fill and over the new foundation. 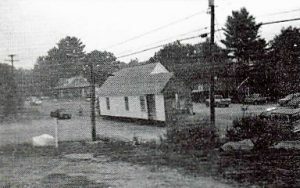 Clarence moved and reinstalled the original granite foundation blocks on top of the foundation, and the Barnaby House had a new home. After the house was placed on its foundation, an enormous amount of further work lay ahead for the small volunteer organization. Following several years of relative inactivity, an enthusiasm for the project emerged among a number of Brookliners who had the knowhow and determination to get the job done. In 2000, with Leo Austin at the helm as President, the renovation of the Barnaby House took off . 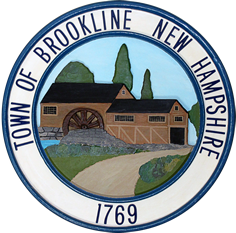 The Brookline Historical Society had started its annual Christmas tree sale in 1998, a project which continues as of 2018 thanks in large part to BHS’s devoted long term secretary, Kim McClure. In 2000, the BHS partnered in weekly bingo held at the renovated Brookline Ski Hill (Big Bear/Musket Mountain ski lodge). Years of selfless volunteer work generate significant revenues for the organization, making possible the extensive work needed to allow the Barnaby House to serve its intended role as a meeting place and repository for historic artifacts. David Fessenden became the BHS president in 2004 and as of 2018, continues in that capacity. Renovation has continued. Display cases were rustled up at every opportunity in order to allow the public display of artifacts. Members continued to work bingo until 2009. Christmas tree sales are still an annual event. The Boston Post cane tradition was revived. In 2005, the organization’s modest but growing collection of artifacts was moved from Town Hall to the Barnaby House for storage and display. The indefatigable Clarence Farwell first formally raised the issue of building an addition off of the back of the Barnaby House in 2005. It was an idea which he, along with countless volunteer hours and generous donations from scores of people, would make a reality six years later. In 2010 Scott Grzyb offered the BHS a most generous gift: an 1800’s era disassembled post and beam barn frame from a barn which had stood in New York State. Thanks to Scott’s great generosity, the BHS’s ambition of serving to promote and preserve the heritage of our town took a large step forward. For years a determined, diligent and skilled crew have been devoting their Wednesday and Saturday morning and more to the ongoing improvement of the BHS barn. Membership in this elite group of craftsmen and putters has been fluid, but the nucleus of the work crew has always been Clarence Farwell, Jim Pope, Delbert Porter, David Fessenden, and Bobby Canada. Joe King and Scott Grzyb were cherished coworkers for as long as their health permitted. It’s nothing short of amazing what these men have accomplished.